Nepal Clearing House Ltd. (NCHL), a public limited company promoted by Nepal Rastra Bank, Commercial Banks, Development Banks, Finance Company and Smart Choice Technologies (SCT) to implement and operate national payment and settlement systems in Nepal. An image and MICR based electronic cheque clearing (NCHL-ECC) system is currently in operation country wide with over 131 banks & financial institutions as its members. 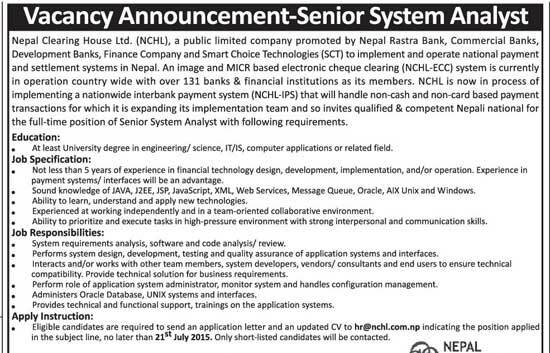 NCHL is now in process of implementing a nationwide interbank payment system (NCHL-IPS) that will handle non-cash and non-card based payment transactions for which it is expanding its implementation team and so invites qualified & competent Nepali national for the following full-time position.